It’s time to get ready for the reunion. Bennie posted a final announcement which you can find on the reunion website. It’s not too late to decide to come. You can find the schedule here. Hello reunion people (former classmates). A week away. Wow. I can’t believe we’ve made it this far. I just checked and I’ve done 102 posts on the blog. There’s 88 comments so far. That’s pretty good activity. Right now I’m doing one of my favorite things, besides blog posts. I’m making supper and I’ve got my Sirius radio cranking. I love the Vault (channel 16) and highly recommend it. Great music. Stuff that wasn’t always top 40. BTW I’m cooking some petite ribeye steaks with lots of garlic/onions, homemade garden salad and tater tots and lots of fresh brewed iced tea. Thanks for you recent emails. Interesting stories coming in. I’ve got to figure out how to put this all together by next week. I know what I’ll be doing this weekend. Okay. Since Mary Kinney made the comment I’ve got to post this. After Bennie dared me to post the picture he had of me I cropped it and put it on my AgWired blog. 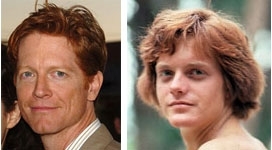 Numerous commenters and friends wrote how much I resembled a young Eric Stoltz. 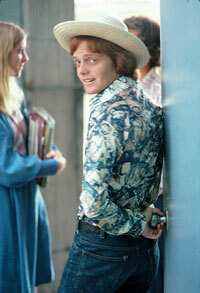 Actually I kind of think he resembles me. So for whatever that’s worth . . . I just found out that Riverview High School has an entry in Wikipedia. It looks like the Highlander Drum Corps folks have been pretty busy online. They’ve got most of the information in the listing. If anyone’s motivated enough you can add to and edit any entry on Wikipedia. It takes a while to get pictures here. But finally, another picture of our reunion leader Nancy Tatom with Pat Cronin, looking over some of Pat’s pics. I guess Pat has donated some pictures for Bennie to use (against) us. I wonder what he’s got up his sleeve. I’m sure we’ll see. Since Bennie triple dog dared me to post these pictures, well . . . Apparently Pat Cronin has given Bennie a box of photos he took during high school and Bennie is busy scanning them to God only knows what he’s going to do with them. 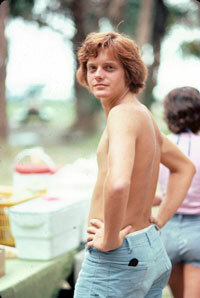 He already circulated these to the planning committee so what’s a few more eyeballs on this gorgeous bod? I put the one with a hat first to tease you so you’d be prepared for this next one. I don’t know where it was taken. Pat, can you help jog my memory? All I can say is I’ve got some extra working out to do to get back to this weight. Although the picture was taken before I could flex those pythons there’s strenth there. You can see it in the eyes anyway. All right Bennie. Are you satisfied? D-Day, Three Weeks And Counting! Please read Bennie’s latest update if you haven’t already. We’ve got 3 weeks left to the reunion and that should give you enough time to read this one (just joking Bennie!). This final broadcast email is going out to everyone who has supplied us with their email address. It has a two-fold purpose. 2. To make one last shameless plea for sign-ups, missing people info and money! If you have signed up and paid your money we are going to send you a personal email within the next 10 days just so you have a confirmation of your attendance. We are not sending out tickets, but will have you listed on sign-in sheets at the events. Comments Off on D-Day, Three Weeks And Counting! I’m sure you all still have this memorized. Me, I’m still trying to. That’s why we write these things down. So we don’t have to. I was just surfing the school website and saw it. Thought you might be interested. Hail Riverview to thee we sing! Here’s a recent update from Bennie on pre-registrations. If you haven’t done so, please go ahead and if you have, make sure you get your payment in. As to your question about registrations, we have approximately 135 for Friday, 133 for Sat and 60 for Sunday. Definitely less than the 20 year but way, way more than some other recent 30 year classes. Sharon says we should be prepared for lots of last minute sign-ups so we expect in excess of 150 for each of the two main events. Bennie also mentioned something about master of ceremonies. I don’t know what he’s talking about. I’m way too shy and bashful don’t you think? I reaaly think I’d have more posted here lately but the travel just won’t let up. 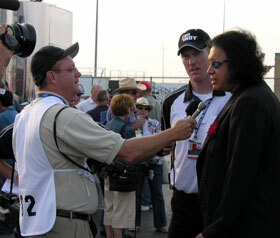 I thought you might enjoy seeing KISS co-founder, Gene Simmons, getting interviewed here by yours truly at Chicagoland Speedway yesterday. While I’m posting locations, here’s where our Sunday event will be. Oscar Scherer State Park is still a wonderful piece of Florida scrubby pine flatwoods. Fifteen miles of trails through these beautiful natural areas provide opportunities for hiking, bicycling, and wildlife viewing. 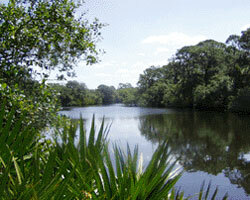 Canoeists and kayakers can paddle along South Creek, a blackwater stream that flows to the Gulf of Mexico. We’ll have some good old-fashioned BBQ and fun for the whole family, so be sure to bring any kids you still have in the nest! Here’s where our Saturday party is going to be. Our Main Event is going to be a smashing party with great food, lively entertainment and a hot dance floor. 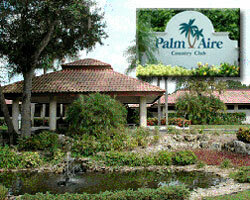 Our facility is the beautiful Club House at Palm Aire Country Club. We’ll have the place decked out in the true Spirit of 76′. We’ve got a great 5-Piece band by the name of “True Pseudo” that will have you on the dance floor all night long! I hope you have your plans made since we’re just over a month away!